Plot: A space freighter takes off with a huge consignment of wheat for ‘a hungry earth’ without realising that a pair of feral rat-like aliens, The Runts, have sneaked aboard. As the crew go into suspended animation for the four-year journey The Runts begin to breed and consume the vast food supplies. By the time of planet-fall the animals are too numerous and large to be stopped, the flood onto the planet and begin to consume earth’s bounty, both cereal and human. Their numbers swamp the army, their size and volume leave gas and explosives inefficient against them, nothing can stop their progress to eradicating all food, including mankind, from the planet. Shock: The Runts ‘suddenly’ stop. They have eaten too much and their stomachs burst. Mankind is saved. Thoughts: Seemingly an extended excuse to use an ‘almost’ dirty-word Alien species name, The Runts’ story puts it pretty close to the list of all-time rubbish Future Shocks. First of all Earth is so starved that they are shipping grain in from planets four years flight away, yet when they reach earth The Runts, presumably from a planet so rich in food man can harvest it, find so much food they eat themselves to death. Unlike The War of The World’s plausible deus-ex of bacteria killing aliens, which the strip clearly seeks to ape, here the Runts’ own biology conspires against them as their lack of a hunger-inhibitor means they simply eat themselves to death. Yet we’ve no understanding of why that didn’t happen in their home-world. Perhaps a diversion to their changing while in space could give a get out of jail excuse for this but none is given. Even forgiving this huge plot hole there rest of the story isn’t much better; the idea that small mammals can sneak into a spaceship inside a Wellington Boot whilst it is being worn is equally ludicrous and unnecessary. What little going in the scripts favour can said to be the nasty scenes it indulges, such as a man being eaten alive by these rat-like creatures, and the manner in which The Runts explode onto the second page. Pat Wright, a veteran of Battle comics, turns in his second and final turn for 2000AD and his Arthur Ranson like art is adequate but lacking in backgrounds and fairly dull. The figure-work varies wildly from great to off. Wright was famous for difficulties with deadlines so maybe some of it was rushed, but The Runts themselves are beautifully illustrated although they do look very photo-referenced in comparison to other elements in the art. Either way the sins of the strip are all the writers and The Runts is a strip best forgotten. Shock’d? 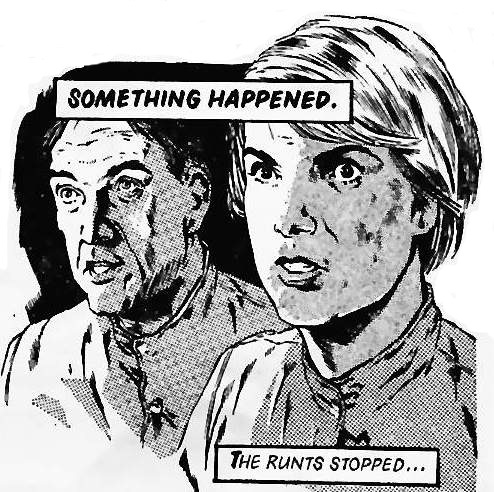 By the middle of page 2 it is clear the runts will be ‘unstoppable until….’ so that a mysterious H.G.Wells type answer comes in the final panel is no shock. Nor is it a shock that it is a botched H.G.Wells type answer given the evidence that the rest of the story hasn’t been thought through.